Today we announced the launch of Mattermark for Salesforce AppExchange, bringing lead enrichment with Mattermark’s unique data set of growth signals to millions of sales professionals using Salesforce to conduct business every day. Beyond our launch announcement, we’ve been thinking a lot about what the modern sales organization could look like so we can build toward living in that future. Why Does the CRM Come Empty? We transitioned the Mattermark sales organization to Salesforce last year, and like every other sales organization we started with an empty shell that needed to be filled in with our leads, accounts, email interactions, calendar invites and tasks. It’s funny to think how many companies are recreating fundamentally the same data set from scratch, with a wide range of accuracy and completeness. All of this work is duplicate effort, carried out by some of the highest paid professionals on the planet. Knowledge workers’ time is valuable economically, but beyond that their capacity for creative thought, self-directed action, and overall executive function are among the highest in the world. I’m pointing this out because traditional sales organizations have MBAs functioning as data monkeys, and in the age of letting computers do what computers can do this is an anachronism. The world needs the modern sales organization to set these people free to do their best work; to let humans be humans and computers be computers. Below is an example of a company record that has been augmented with Mattermark. It is up-to-date all the time because it is automatically refreshed as information changes. There are more than 80 fields available in addition to recent news events, which give sales people some ammunition to break the ice. We’re obsessed with shipping iteratively, and getting into the Salesforce channel opens a new door for product discovery and satisfying our user’s needs. We’ve been available in Salesforce through an API “bulk sync” integration since almost the very beginning, but AppExchange makes our lead enrichment solution available to far more users. The ease of adoption, and low cost of entry (just $49/month to get started) make this a no brainer for any company with a modern sales team. 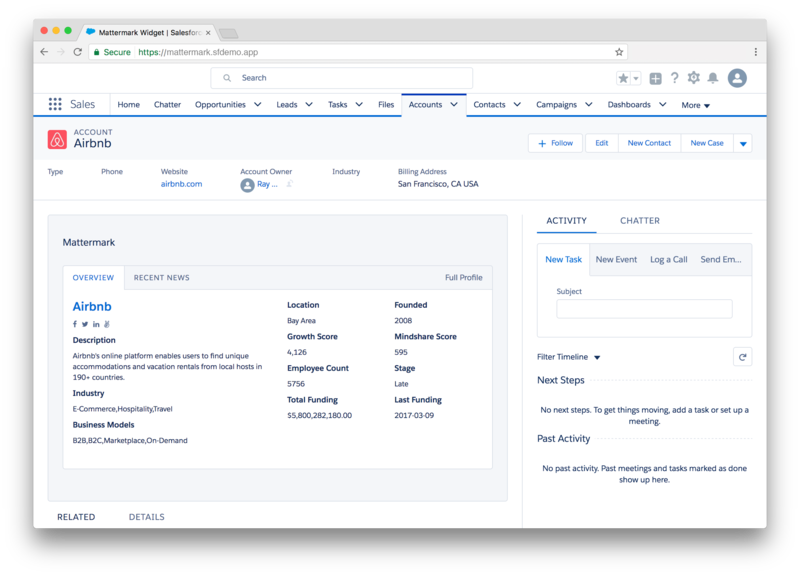 The next thing we are building for Salesforce is simple but powerful: we’ll give users the ability to fill up the CRM with the accounts they want. Instead of starting out empty and filling it up, we want to give you the opposite experience. Every possible account is available to you with Mattermark, and through application of your ideal customer profile criteria you can chisel away at this massive block of possible customers to come up with the best possible targets to go after. Whether you’re just getting started with Salesforce or have been using it for a long time and want to break into new target accounts, we’re here to help. If you’d like to get started with Account Discovery we’d love your feedback, and you can apply to be considered for the private beta by filling out the form below.